The Life of James Everell Henry, by James Everell Henry II, 2016. This reprint of a privately published biography of J.E.Henry provides a fascinating insight into the life and times of the notorious Lincoln, NH lumber baron. 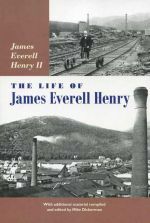 Written by his grandson and originally published in 1962, it reveals many interesting details about Henry's life and the operation of his logging railroads in the Zealand and East Branch Pemigewasset valleys. Publisher Mike Dickerman has supplemented the biography by compiling 11 other pieces about and remembrances of Henry, presenting a variety of viewpoints. Illustrated with vintage photos, many of them unusual. 152 pp., 6" x 9."